Samba Brazilian Steakhouse, located on LA’s iconic Universal CityWalk, offers a variety of special event options, perfect for specific party needs, wants or budgets! Their private banquet room can accommodate up to 100 people with a 50-­person minimum. Offering an all-­you -­can-­eat style menu with different cuts of meats grilled on an open fire and carved table-side, grilled options are accompanied with a variety of hot side dishes and salads. Samba’s full-­bar can easily satisfy all, with fine domestic and imported wines, Samba’s dedicated Caipirinha bar, serving over 10 types of Brazil’s national cocktail, a variety of beers and mixed drinks galore. With Samba’s variety of menu items, you will be customizing your menu options from our many choices provided. The room boasts a stage, private bar, small patio area and dance floor as well as salad bar built-­in. 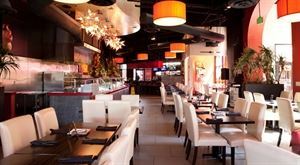 Samba Brazilian Steakhouse, located on LA’s iconic Universal CityWalk, offers a variety of special event options, perfect for specific party needs, wants or budgets. For those smaller, intimate parties, the mezzanine will provide the cozy, warm atmosphere accommodating up to 28 people. With a dedicated on server on hand, the specialty meats and Samba’s signature dishes will surely delight all. The room overlooks the main dining room and can seat up to 28 people with a 20-­person minimum. Guests will be provided a 4-­hour allowance complete with a private Samba Dancers show performance when event is booked within their regular performance hours. • There is a nominal, $200.00 room fee that will be added to the final bill along with tax Please visit our website for more details. The final bill will include a 9% CA tax and 20% gratuity that will be automatically be added for your convenience. Samba Brazilian Steakhouse, located on LA’s iconic Universal CityWalk, offers a variety of special event options, perfect for specific party needs, wants or budgets. Their private banquet room can accommodate up to 100 people with a 50-­person minimum. It provides comfortable seating for up to 120.The room boasts a stage, private bar, small patio area and dance floor as well as salad bar built in. •	$350 room fee includes Linen + $150.00 for each additional hour. The package includes: • Stage area + dance floor • Full bar & built-­in buffet station • Live samba show & beautiful dining area • Balcony with views of Citywalk Please visit our website for more details. Samba Brazilian Steakhouse, located on LA’s iconic Universal CityWalk, offers a variety of special event options, perfect for specific party needs, wants or budgets. The main dining area, overlooking Samba’s comfortable patio and bar, can accommodate larger parties, for those wishing to celebrate birthdays, graduation parties or any other special milestones. Reservations are required and special accommodations can be made to make every event memorable. Guests will be allowed up to two hours maximum and you and guests will be seated as soon as the majority of the party arrives. Please visit our website for more details. Mezzanine Parties: For those smaller, intimate parties, the mezzanine will provide the cozy, warm atmosphere accommodating up to 28 people. With a dedicated on server on hand, the specialty meats and Samba’s signature dishes will surely delight all! Overlooking the Bahia Marina, steps from sandy beaches, golf, water sports, dining, shopping and entertainment. Featuring 173 spacious guest rooms, The Sails Restaurant and the PCH Club. It's become the spot for affordable family vacations or business trips, where guests enjoy our Olympic size pool, Jacuzzi and 7 acres of spacious lawns, generous in-room amenities, and a close proximity to many nearby attractions. When looking for hotels in Long Beach to host your meeting or social event, look no further than the Golden Sails Hotel & Conference Center. We offer 17,000 square feet of event space with a varied selection of room sizes, on-site catering, AV equipment, high speed Internet, and exceptional hotel amenities. You’ll love our spacious gazebo and bar areas, in addition to our professional event planning team to help plan your best event yet. Cruise Newport Beach offers yacht & ship rentals year round for all types of cruise options including sunset, brunch, coastal, evening, Catalina Island, and for many of the holidays (including our famous holiday lights cruises during the entire month of December which includes the famous Newport Beach Christmas Boat Parade Of Lights), and all types of celebrations. Public cruises are also offered year round including live entertainment cruises. Cruises depart from beautiful Newport Bay and can travel along the world famous coastlines of Newport Beach, Laguna Beach, Huntington Beach, or to exotic Catalina Island. Amazing scenery and perfect weather creates the perfect environment for making a memorable and incredible event. Along with the many year round cruise types to choose from, Cruise Newport Beach offers ship rentals in the world famous Newport Beach Christmas Boat Parade of Lights during the 5 night event each year as well as holiday light cruise rentals for the entire month of December. The Newport Beach Christmas Boat Parade of Lights has over 2 million people viewing the parade each year and hundreds of ships, yachts, and all sorts of watercraft competing for top honors during the 5 nights of the parade. Cruises during the parade nights not only view the parade but are in the parade what could more exciting for your company event. Along with the parade, estates that line Newport Bay also compete in their own competition the “Ring Of Lights” creating a magical holiday landscape unique to Southern California. Located right on the border of Koreatown in the upcoming neighborhood of Arlington Heights, Catch One is redefining the Los Angeles nightclub experience. Catch One brings a world-class lineup that prizes quality and diversity, hosting everything from local juggernauts A Club Called Rhonda to Boiler Room to Soulja Boy to Die Antwoord. With 5 rooms, affordable drinks and a welcoming staff, Catch One is already upping the ante for L.A. nightlife. If you are planning a Wedding reception, Business meeting, Birthday party or any event, the Planes of Fame Event Venue offers your group an opportunity to step back in time! Our beautiful Maloney Hanger transforms into a wedding venue, banquet hall or reception hall large enough to host up to 320 people for a sit-down dinner. From 10 to over 500 people, we can tailor our facility to suit your occasion! We look forward to working with you to ensure your event is delightful. Think of us for your next reunion, company party, annual meeting, reception, corporate meeting, retirement, birthday, holiday party, anniversary, wedding, and club meeting! We are a non profit 501 (c)(3) organization that has grown for the past 57 years through donations.